Bitcasino is a well established Bitcoin gambling operator that offers casino games, poker room, live dealer platform and sports betting. This operator is one of the first Bitcoin operators to obtain an online gambling licence. Hence, the site is licensed by the government of Montenegro. Bitcasino Sportsbook was launched in 2014 and since then it has been successfully working and attracting thousands of bettors on daily basis. This sports betting Bitcoin site is very attractive thanks to its modern looking design, good selection of sports and competitive odds. 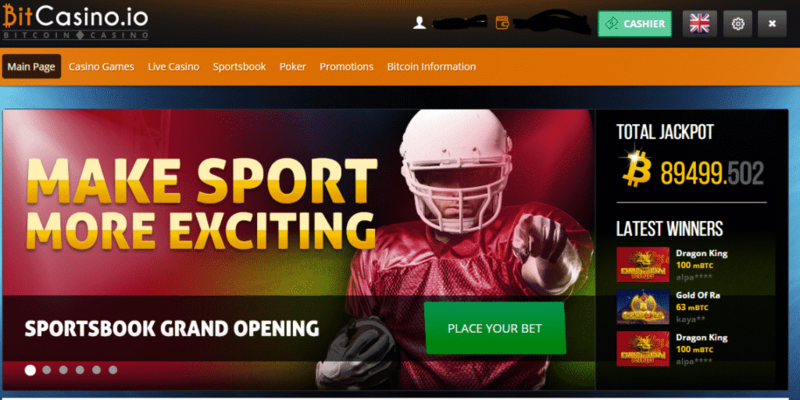 Some other pros of joining this Bitcoin sportsbook are the various safety certificates the site holds, the excellent customer support service as well as the possibility to open the sportsbook in nine different languages. 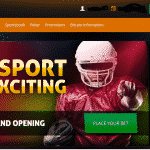 Bitcasino offers a high quality Bitcoin sports betting platform. The design is excellent and it allows bettors to easily navigate throughout the site. There are more than 10 different sports featured at this sports betting platform including football, basketball and tennis. Besides major sports leagues such as English Championship, NFL and MLB, Bitcasino Sportsbook also offers betting on special occasions such as World Cup, CONCACAF Gold Cup and etc. The sportsbook is available 24 hours a day, seven days a week and it offers quite competitive betting odds. Bettors can bet on single event as well as on multiple events. Unfortunately, there is no live streaming provided at the site. The minimum bet amount at this sportsbook is 0.001 BTC. In addition to the sportsbook that provides betting on events pregame, Bitcasino features a live betting platform as well. The live betting sportsbook offers comprehensive betting options, nicely organised game schedule and user-friendly interface. Live in play bitcoin betting brings more excitement and action allowing bettors to bet on games as they play out, with odds changing every minute. The sports betting section has two very helpful features that make the overall process of betting and tracking results very simple for customers. First, the site offers an easily accessible Active Bets section where users can see their active bets and check whether the current results are in their favour or not. Second, there is a Betting History section where bettors can see their past bets as well as their outcomes. With this feature, not only they can see how good their guesses have been in the past, but they can track their losses too. Sports bettors at Bitcasino Sportsbook are often treated with a free bet. In order to receive this offer customers have to place a qualifying bet on a selection whose odds are higher than Evens (2.00). Free bet bonuses must be placed on bets containing selections at odds of at least 1.50. Free bet bonuses are valid for 30 days and if they are not placed during that period they will expire. It has to be pointed out that free bet bonuses are non-refundable and they cannot be used at the other gambling platforms of the site such as the casino or the poker room. Bitcasino Sportsbook also offers deposit and reload bonuses to people who use their sports betting services. The minimum deposit amount that qualifies for these bonuses is 10 mBTC and these bonuses are valid for 30 days as well. The minimum wagering requirements for all offers are three times deposit + bonus amount. Bitcasino has a reasonable minimum deposit amount of 0.001 BTC. Bettors who will manage to win 50 BTC or more will receive their winnings in weekly installments of 50 BTC until the whole amount is paid. It has to be pointed out that this Bitcoin betting operator is using mBTC instead of BTC. Therefore, if you make a deposit of 0.5 BTC, your account will be credited with 500 mBTC. Customers at Bitcasino Sportsbook are given the great opportunity to keep their anonymity. The sign up process requires no personal information, whereas making money transaction are done using Bitcoin wallet addresses only. Additionally, this gaming site is secured by Crowdcurity. Sites that have this seal meet high safety and security standards for exposure, persistence and incentive. As a result, bettors at the Bitcoin Betting platform are both 100% anonymous and safe. Bitcasino Sportsbook provides an excellent and constant working customer support service. The support team of this betting site can be contacted via live chat or e-mail. E-mail queries are answered relatively fast, whereas Bitcasino Sportsbook features an extensive FAQ section as well. Bitcasino Sportsbook is one of the best Bitcoin sports betting sites on the market. Customers at this gaming destination need not worry about their safety, plus they are provided with a professional 24/7 customer support service. Additionally, Bitcasino Sportsbook features competitive odds and a great selection of sports events that gives bettors numerous chances to earn profit. Finally, this Bitcoin site has reasonable betting and banking limits; therefore, it can meet the needs of both low and high roller bettors.